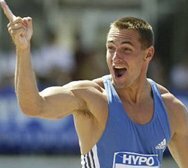 Place of birth: Lanskroun, Czech Rep.
Only man over 9000 points, 6 times (out of a total of 22) over 8800 points, stands 4th on the Personal Best rating, holds the top position in points over the 10 best decathlons by an athlete, rates 7th in the best lst day competition, 5th in the best 2nd day competition. Sebrle is the superman of athletics ! I am glad to see Roman Sebrle still competing. He is still a 6000+ heptathlete and 8000+ decathlete in 2010, his fifteenth season of being an international force to be reckoned with. Keep going, Roman--on to London 2012! Also world best for 37 years. Czech championship in Prague, Stromovka - 6105 - (07.19/816-7.67/977-15.67/831-2.11/906-08.22/927-4.80/849-2:46.82/799) - great performance, the man is incredible. This man is incredible. Not only for the past results but also for what is doing now, still over 8000 pts at 37! In an event so explosive and wearing out. My congratulations also to his coaches, who managed to keep them out of big injures for such a long time. I bet he can still do 8100/8300 in London so... best of luck Roman! By the way I reckon he's got the World Record Master M35 as well, looking at his 2011 result. Does anybody know what is that score in WMA points?